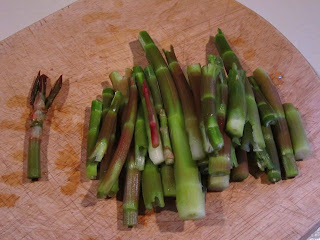 As I mentioned before, I was inspired by the book An Everlasting Meal to start saving vegetable scraps for stock. Well, finally my freezer was full and I had time to spend the day in the kitchen. I made two batches: vegetable and chicken. The vegetable stock was a combination of: onion, carrots, celery, tomato, potato, parsnip, kale, asparagus, mushrooms, parsley, leftover salad, peppercorns, bay and salt. This simmered for about an hour and a half and I ended up with 7 pints of vegetable stock. These were processed in the pressure canner for 30 minutes at 10 pounds. For the chicken stock, I used up the bones of two chickens I'd roasted last weekend. The bones and a little meat had been frozen, along with the necks and organ meats, and I combined these with carrot, onion, celery, parsley, kale, and broccoli scraps and then salt, peppercorns, bay and thyme. I let it simmer while the vegetable stock was in the canner, and now I am canning the chicken stock in 2 batches. There are 14 pint jars in the canner currently and I think maybe there is enough for 5 or 6 more jars. That should last me a while! As an added bonus, I'm taking out whatever usable meat there was in the stockpot and setting it aside to make a little something. Not sure what, just yet... maybe just a bowl or two of soup. The 6 year old is now 7. Happy Birthday! 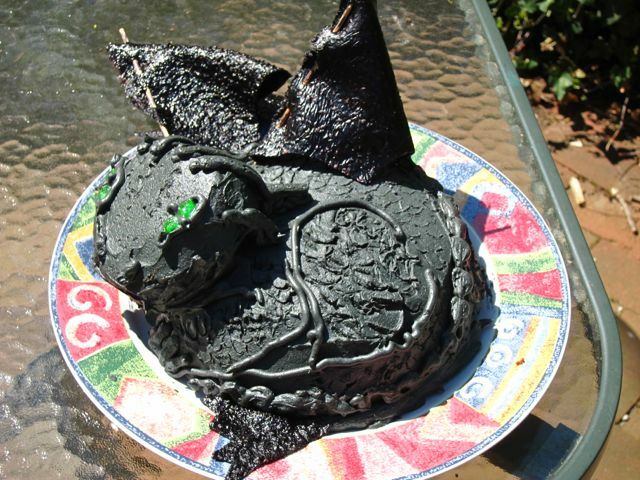 The only request as far as a cake went was that it should look like Toothless, the dragon. How in the world was I going to do that? Enter the soccer ball cake pan. That thing has been: a ladybug, a jack o'lantern, a golden snitch, and now a dragon. I have never actually made a soccer ball cake. But I also used a heart shaped springform pan and took a little of the cake batter to fill that. That's the head. I cut the point off the chin and used bamboo skewers to join it to the body. Then I struggled with the wings and tail. I had come up with the idea that fruit leather could be used to make the wings. It used to be the case that you could find fruit leather in the store that could be unrolled and cut but, now that I needed it, I couldn't find any. I decided to make some. 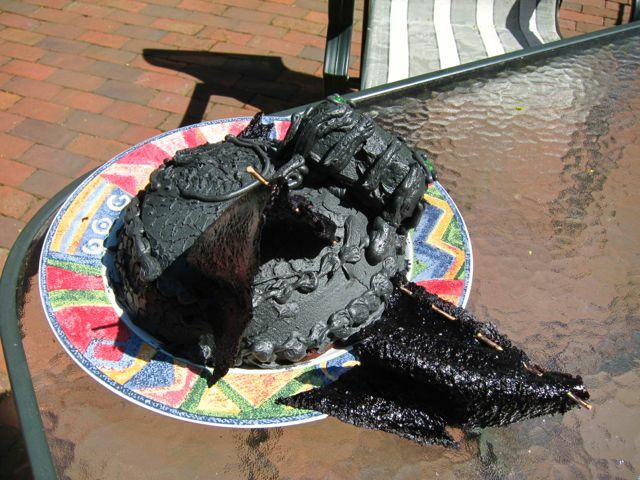 I bought 2 pints of blackberries and pureed them, added water (almost 2 cups), sugar (1 cup) and lemon juice (1 Tbsp., I think), and some black food coloring and then cooked it on the stove for a little while to thicken. Then I spread it on saran on a cookie sheet (the kind with edges) and kept it in the oven, set to warm, for about half a day. Maybe longer. When it was ready I chilled it so I could work with it. A little while back, I made a salad entirely of bittercress and goat cheese. It was pretty sharp, and I wondered if maybe there was a happy medium. Well, I may have found it. Incidentally, I tried eating the dandelion buds and flowers and...blegh. Not raw, anyway. Maybe they can be braised? A few days ago I peered out a window at the hospital and found, in a courtyard, some very large greens. I thought they might be curly dock but when I got a closer look, they weren't. But, what were they? I spent a bunch of time with my iPhone app and also various pictures on the web, and wikipedia, and finally felt confident that they were a form of wild lettuce, Lactuca canadensis. I picked a huge amount and also some large dandelion leaves. When I got home, 12 hours later, I washed it all, separated the dandelions, and blanched everything. The dandelions were frozen, as were some of the wild lettuce, and I saved a cup of them for tonight, when I had time to make a risotto. The recipe comes from Hunt, Gather, Cook and originally called for nettles, but the author (Hank Shaw) said any kind of wild green would do. I bought some oyster mushrooms to add in. To make the risotto I sauteed the mushrooms, some shallots and garlic in butter and then added a cup of Arborio rice and a teaspoon of salt. When everything was coated in butter, I added a cup of stock and brought it to a boil, then let it simmer and absorb. I gradually added a total of 4 cups of stock (2 turkey and 2 chicken) plus the greens. When all the liquid was absorbed I added some more butter and about half a cup of grated parmesan and let everything meld together. This was served with a pot roast. My husband declared this risotto on par with anything he's ever had in a restaurant. 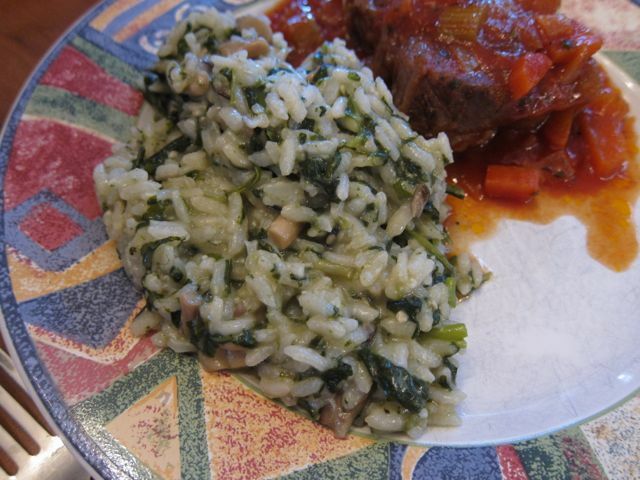 And he loves risotto! You can see the tiny chickweed flowers in the salad. Lately I've been spending a lot of time looking at the ground. 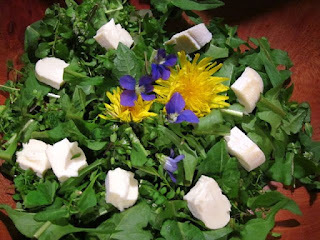 I find that there are more edible weeds around than I knew! 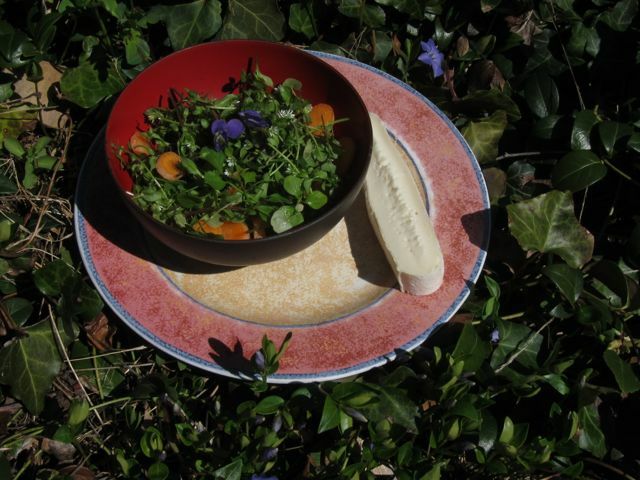 The other day I discovered I had chickweed growing in the front of the house and that it does, indeed, taste like corn. Works for me! 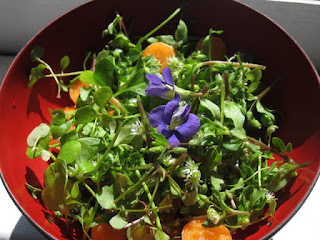 Today I made a quick salad with chickweed, bittercress, some carrots and violets for garnish. Served with a side of Robiola Due Latti cheese, it makes a refreshing lunch.